That is a question that concerns many Christians as soon as we start talking about freedom from the law. Some believe we are no longer under the ceremonial law of the Old Testament but we still must adhere to the basic Ten Commandments from Moses. Others go to another extreme, emphasizing that we are “once saved, always saved” and nothing we do from the point of salvation on can remove us from God’s promise of eternal life. Those on the other side squirm – does the freedom faith in Christ gives me mean I can continue to live anyway I want, even to ignore what God labels as sin? Paul addresses this issue in Galatians 5. God does not base our righteousness on how many outward regulations we keep. God looks at the inner man and what fuels man’s desire to keep or break God’s commandments. Paul summarizes that we can’t be in God’s good graces by merely obeying one or two or ten laws. To break even one law makes us a law breaker (v. 2-4). We need another system that restores our relationship with the Almighty. It’s faith and acceptance of His plan to redeem us from the slavery of sin that puts us in a right relationship with God. Faith is much more than a simple acknowledgement of Jesus’ existence. It’s an acceptance of the fact that I have disobeyed God, that at the core, I am a disobedient child. Acceptance of His gift of salvation means I’m willing to lay aside my selfish desires and love Him and love others as Christ has loved me. What does faith expressing itself in love look like? In Matthew 22:37-39, Jesus reiterated the Greatest Commandment of love already stated in the Old Testament. (Deuteronomy 6:5, and Leviticus 19:18). God calls us to love the Lord our God and to love our neighbor as ourselves. 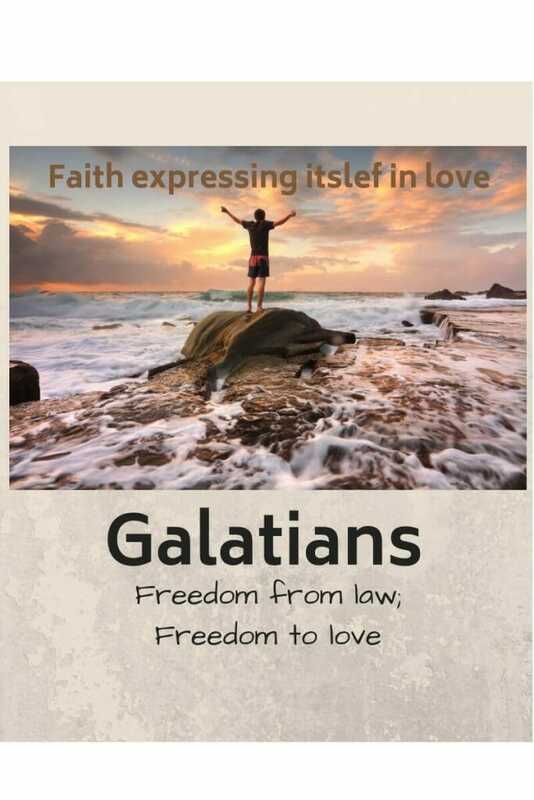 In our study of Galatians 5, Paul expands on this idea, saying that the crux of the Christian faith is faith expressing itself in love (Galatians 5:6). When I choose to act in ways that express God’s kind of love toward others, I show that I trust His way works, even if it seems to fly in the face of all worldly sensibility. I’m making His desires my desires. My longing to satisfy myself and be lord over others is replaced by a desire to sacrifice myself for the good of others. How do we fall away from grace? Succumbing to our fleshly desires that result in certain actions (vs.7-21). Everyone sins. No one is perfect. How can I get a handle on temptation so I sin less? I’m wondering if many Christians have difficulty overcoming sin because they haven’t identified the root of what tempts them. James says that our desires combine with Satan’s temptations to lure us into sin (James 1:14-15). Perhaps we need to identify which of our desires are out of alignment with God’s desires and ask Him for a desire do-over. Is it possible that as our desires change from a self focus to a God focus, we won’t commit as many sinful actions? Change my heart O God. How will I know when my desires are more in alignment with what God wants? Are you feeling insecure with your relationship with Jesus? Are you aware of what tempts you and how often you succumb to those temptations? Do you feel like you see more vice than virtue in your life? Let me encourage to do the following this week. Take some time to assess what tempts you most and how those temptations are connected to desires. Are your desires linked to pleasing yourself, pleasing others, or pleasing God? How are your desires based on faith expressing itself in love? How can you change your desires to be more in tune with God’s purposes? Look over the list of the fruits of the Spirit in Galatians 5:22,23. Which of these fruits are evident in your life? How have you grown in these areas in the last year or five years? If each year, you are yielding a bigger crop, take heart! The Holy Spirit is present in your life and He is guiding you to become more like the Father. Finally, each day, every day, recommit yourself to staying in step with the Holy Spirit. Ask God to guide you and direct you. Tell God once again that you want what He wants and that you are willing to lay aside your own selfish, worldly desires so you can follow Him. We definitely need to identify the root in order to grow with God in the things which tempt us. Thank you for responding! And may our desire to express our love for God compel us to grow in our character traits that portray the Savior to a watching world.